Something about seersucker just feels like summer to me! The stripey style has been very “in” this season and it’s a trend I’m loving. I recently just ordered another pair of the shorts from the Lauren James Pink Friday sale, so my collection is already growing! Be sure to check out the links of all the pieces I’m wearing under the photos. If I couldn’t find the exact item I have, I found some similar things I think you’ll like! First up, the dress that inspired this post! I got this dress for 40% from American Eagle, but I couldn’t find it anywhere online, so I linked some similar styles! This is the look I was sporting for the Fourth of July! see this one on my Instagram! Last, but definitely not least, the look I was sporting on the day of this shoot. I love these shorts from Lauren James! They’re so comfortable and a cute alternative to my typical Nike running shorts. And, the best part is, they’re made for Florida State! Shirt: I have this one in 3 different colors, and it’s currently on sale for 20% off! Which of these looks was your favorite? The dress is my new favorite, but I love these shorts because they’re designed for Florida State! DIY Bible Verse Jars & Free Printable! 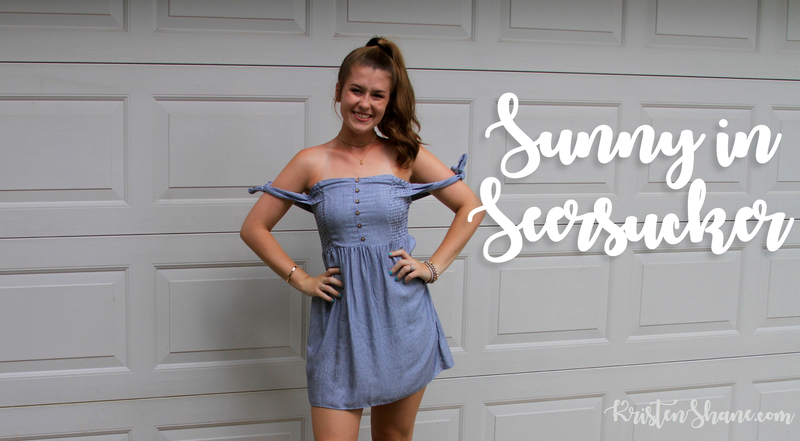 I adore that seersucker dress so much and the shorts in the last outfit are darling! Great outfits. I agree!! It’s a perfect match & my new fave! I love the fl state shorts!!!! They’re on sale for $5! !